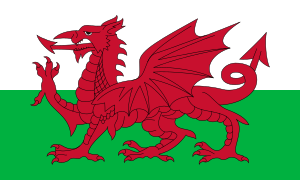 The flag of Wales (Welsh: Baner Cymru or Y Ddraig Goch, meaning the red dragon) consists of a red dragon passant on a green and white field. As with many heraldic charges, the exact representation of the dragon is not standardised and many renderings exist. The flag incorporates the red dragon of Cadwaladr, King of Gwynedd, along with the Tudor colours of green and white. It was used by Henry VII at the Battle of Bosworth in 1485, after which it was carried in state to St Paul's Cathedral. The red dragon was then included as a supporter of the Tudor royal arms to signify their Welsh descent. It was officially recognised as the Welsh national flag in 1959. The dragon as a major flag design element is shared with the flag of Bhutan. A dragon also appears on the badge of the George Cross on the flag of Malta. The Chinese flag also featured a dragon during the Qing Dynasty. Several cities include a dragon in their flag design, including Cardiff, the capital city of Wales, Ljubljana, the capital city of Slovenia, and Puerto Madryn in Argentina. 15th-century image illustrating the story of Vortigern and the red and white dragons. The flag was granted official status in 1959, but the red dragon itself has been associated with Wales for centuries, though the origin of the adoption of the dragon symbol is now lost in history and myth. A possible theory is that the Romans brought the emblem to what is now Wales during their occupation of Britain in the form of the Draco standards borne by the Roman cavalry, itself inspired by the symbols of the Dacians or Parthians. The green and white stripes of the flag were additions by the House of Tudor, the Welsh dynasty that held the English throne from 1485 to 1603. Green and white are also the colours of the leek, another national emblem of Wales. The oldest known use of the dragon to represent Wales is from the Historia Brittonum, written around 830; the text describes a struggle between two serpents deep underground, which prevents King Vortigern from building a stronghold. This story was later adapted into a prophecy made by the wizard Myrddin (or Merlin) of a long fight between a red dragon and a white dragon. According to the prophecy, the white dragon, representing the Saxons, would at first dominate but eventually the red dragon, symbolising the Britons, would be victorious and recapture Lloegr. According to the legend, this victory would be brought about by Y Mab Darogan. This is believed to represent the conflict in the 5th and 6th centuries between the Britons and the invading Saxons. A version of the tale also appears as part of the poem 'Cyfranc Lludd a Llefelys' in the Mabinogion. One twelfth-century account of this is Geoffrey of Monmouth's Historia Regum Britanniae, where he states Merlin's prophecies. The red dragon is popularly believed to have been the battle standard of Arthur and other ancient Celtic/Romano-British leaders. There is considerable evidence to suggest that during this period the dragon was a symbol of the Romano-British monarchy and possibly Romano-British society more broadly, including some from Anglo-Saxon poetry. The dragon is particularly associated in Welsh poetry with Cadwaladr king of Gwynedd from c.655 to 682. The Dragons of Arthur and Cadwaladr were possibly based on the draco standards carried by Roman cavalry units stationed in Britain. The Draco originated with the Sarmatians, a unit of whom were stationed in Ribchester from the 2nd to 4th centuries. Despite the close link throughout early Welsh history, the dragon was not used exclusively as a symbol for Wales during this period, and it was used throughout Britain as a symbol of authority. In 1138, it was adopted by the Scottish as a royal standard, and Richard I took a dragon standard to the Third Crusade in 1191. Henry III fought under the dragon at the Battle of Lewes and it was used later by Edward III at the Battle of Crécy. In 1400, Owain Glyndŵr raised the dragon standard during his revolts against the occupation of Wales by the English crown. Owain's banner known as Y Ddraig Aur or "The Golden Dragon" was raised over Caernarfon during the Battle of Tuthill in 1401 against the English. The flag has ancient origins, Glyndŵr chose to fly the standard of a Golden dragon on a white background, the traditional standard. Fifteen years later the English crown, under the rule of Henry V, used the red dragon standard itself during the Battle of Agincourt. The English forces during the battle utilised Welsh longbowmen, along with their own archers. 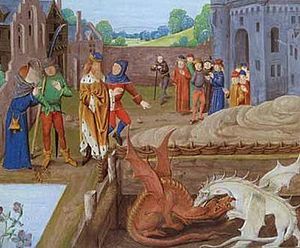 In 1485, the most significant link between the symbol of the red dragon and Wales occurred when Henry Tudor flew the red dragon of Cadwaladr during his invasion of England. Henry was of Welsh descent and after leaving France with an army of 2000, landed at Milford Haven on 7 August. He made capital of his Welsh ancestry in gathering support and gaining safe passage through Wales. Henry met and fought Richard III at the Battle of Bosworth, and in victory took the English throne. After the battle, Henry carried the red dragon standard in state to St Paul's Cathedral, and later the Tudor livery of green and white was added to the flag. 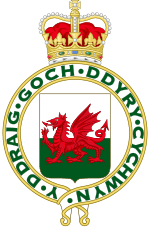 In 1807, the red dragon on a green mount was adopted as the Royal Badge of Wales, and on 11 March 1953 the motto Y Ddraig goch ddyry cychwyn ('The red dragon gives impetus' or 'The red dragon leads the way') was added, a line from the poem by Deio ab Ieuan Du. The badge was the basis of a flag of Wales in which it was placed on a horizontal white and green bicolour. In 1959, government use of this flag was dropped in favour of the current flag at the urging of the Gorsedd of Bards. Today the flag can be seen flying from the Senedd in Cardiff, and from the Wales Office in Whitehall, London each day. Flag of 1953–59, depicting the Royal Badge of Wales after its augmentation of honour. Flag of Puerto Madryn and Y Wladfa. The red dragon on the tailfin of an Air Wales ATR 42 aircraft. The flag of Saint David, a yellow cross on a black field, is used in the emblem of the Diocese of St David's and is flown on St David's Day. In recent times the flag has been adopted as a symbol of Welsh nationalism. However, traditionally, in both Protestant and Catholic traditions, crossed emblems have only been allocated to those martyred in the name of Christianity. Examples are saints such as St Andrew (Scotland), St George (England), St Denis (France), and St Alban (England/Hertfordshire). The flag of Wales has been used by those in the arts, sport and business to show a sense of patriotism or recognition with Wales. During the 1999 Rugby World Cup, which was hosted in Wales, the opening ceremony used the motif of the dragon several times, though most memorably, the flag was worn on a dress by Welsh singer Shirley Bassey. Other musicians to have used the flag, include Nicky Wire of Manic Street Preachers, who will often drape the Welsh flag over amps when playing live, and Cerys Matthews who has worn the image on her clothes, while classical singer Katherine Jenkins has taken the flag on stage during live performances. Flag of Wales Facts for Kids. Kiddle Encyclopedia.